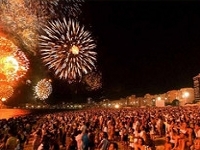 Brazilians know how to party and Rio's New Year (Reveillon) celebrations are ranked among the world's biggest extravaganzas. This jovial city hosts musical shows in several districts to bring in the New Year, the Copacabana beach hosts a crowd of more than two million people annually. Partygoers dress in white to bid farewell to the previous year and celebrate the arrival of the next. A fabulous display of fireworks illuminates the sky at midnight, amid much festivity, dancing, and happiness. Hotels, clubs, and restaurants also offer a variety of party options with formal balls, diverse menus, and tropical buffets.